Organza fabric is multifunctional and it has been making fashion world so fascinating, ever since designers use it to associate with fashion or couture. Even though styles and trends change frequently, organza fabric is still so popular and preferred among people especially women, which is due to often being utilized in new and innovative ways. Between wedding attire and uptown evening fashions, organza’s future in the world of fashion is secure. This article is intended to introduce the knowledge of organza fabric, so that you are able to have a deep and comprehensive understanding for it. Organza is a thin, plain weave, sheer fabric traditionally made from silk. Many modern organzas are woven with synthetic filament fibers such as polyester or nylon, these synthetic filament fibers enable fabrics to be more durable and practical than silk. Silk organza is woven by a number of mills along the Yangtze River and in the province of Zhejiang in China. A coarser silk organza is woven in the Bangalore area of India. Deluxe silk organzas are woven in France and Italy. Organza is used for bridalwear and eveningwear. In the interiors market it is used for effects in bedrooms and between rooms. Double-width organzas in viscose and acetate are used as sheer curtains. How to distinguish between organza and organdy or organdie? As a crisp, see-through fabric that is lightweight and thin, organza has a distinctively fine texture and presents with a slight sheen; it has a shimmery quality to it that catches and reflects light. Because of its lightness, it is often used in bridal wear as a veil or as a layer in the dress itself and in cocktail or prom dresses. A stiff fabric, it has a slightly wiry quality to it, but it wrinkles easily. Organdy or organdie is the sheerest and crispest cotton cloth made which comes from Kounya-Ourguentch in Turkmenistan. Combed yarns contribute to its appearance. Organdy is a balanced plain weave. Because of its stiffness and fiber content, it is very prone to wrinkling. Organza and organdie are similar, only the fibers are different. Both fabrics are transparent, crisp and woven with very fine, tightly twisted yarns in an open, plain weave. Organdy is usually cotton or nylon, while organza can be made of silk, polyester or rayon. Organza is the filament yarn counterpart to organdy. 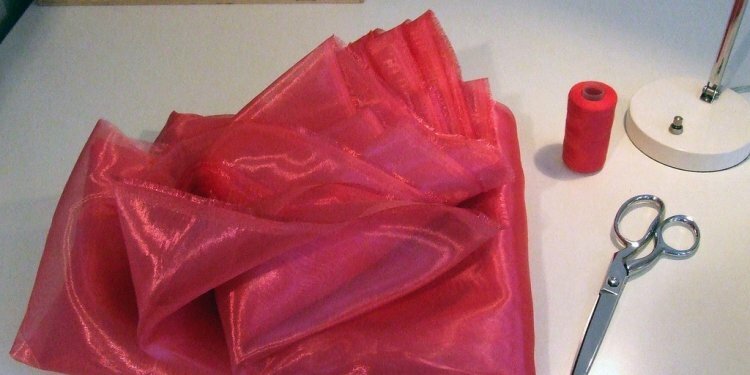 How many types of organza fabrics? Lightweight sheer crystal organza with a crisp texture and sparkle sheen. This type of organza is the most common. It is made from either silk, polyester or nylon. Used for all types of specialty apparel including bridal. Lightweight sheer morror organza adds a hint of shine with a unique texture. It is durable and comfortable. Suitable for a variety of uses including garments and decorative purposes. Most colors are match-able with polyester poplin, taffeta, and satin fabrics. Sparkled Organza brings shimmer to any garment. It is also considered for decorative purposes, such as table toppers, centerpieces, pew swags, and window scarves for parties. Silk organza is woveb by a number of mills, it is the most expensive organza and the most prized. This type of Organza must be dry cleaned. Organza is now being made from polyester and nylon to help ease cost.